It doesn’t matter how carefully you look round a house before you buy it, there are always some little ‘surprises’ once you move in. Plus, after the move, you always have packing material to deal with. When the two new mattresses arrived at my sister’s house, they had some wadding protecting the corners. She had put this to one side in case we could think of something to do with it. It sat in a small pile for a few days and we pondered. During this time, we noticed that the house was rather draughty and discovered that the inner front door (there’s a porch too) had a rather wide gap below it that was allowing lots of cold air in. The only draught-excluder in the house was too narrow for the door… reducing the draught, but allowing quite a bit round the sides. 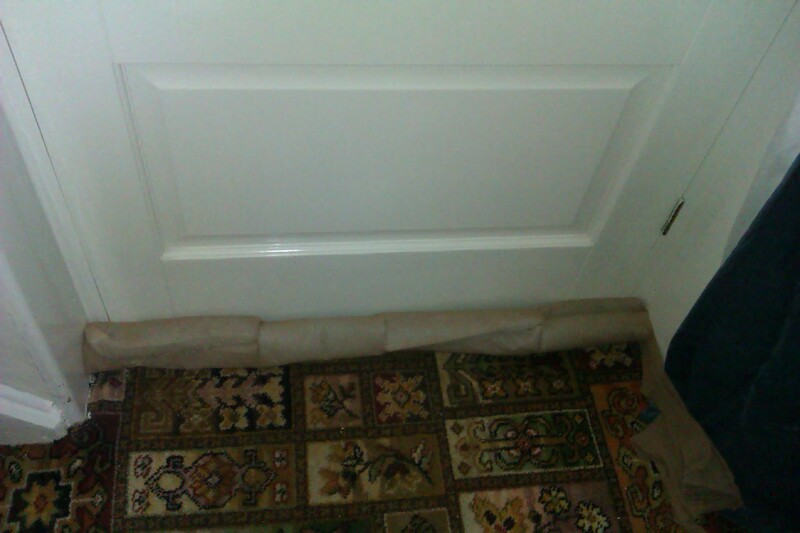 So, what better use for the wadding than a new draught-excluder? First of all, we played with the pieces to see if they would fit across the door – they did if orientated correctly. 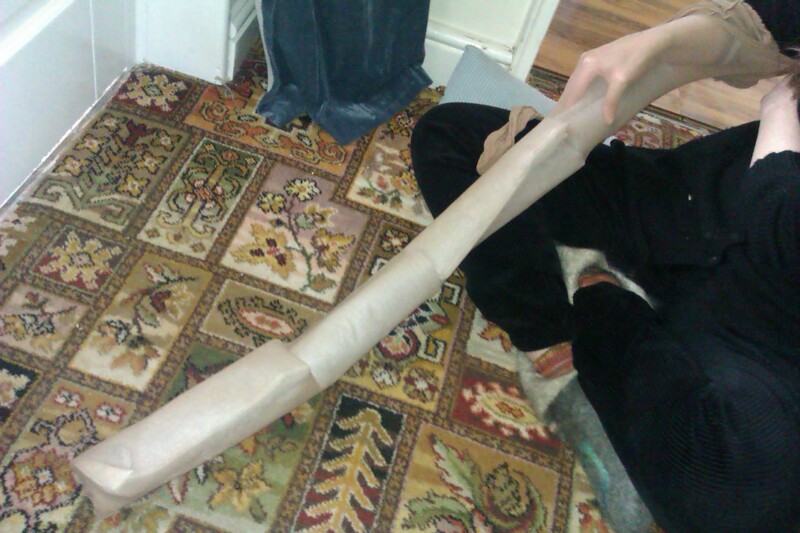 So, we rolled each piece up and, to keep them rolled up, we stuffed them down one leg of an old pair of nylon tights. A bit of jiggery-pokery and the other leg was used to provide a double layer, before tying the top off and snipping off the excess. We double-checked to make sure that our creation fitted snugly across the bottom of the the door and then turned our attention to making it more aesthetically pleasing. The blue curtain you can see in the background of the first picture is only a temporary measure and a new terracotta one is destined to go over the front door, so we wanted to make the draught-excluder match. 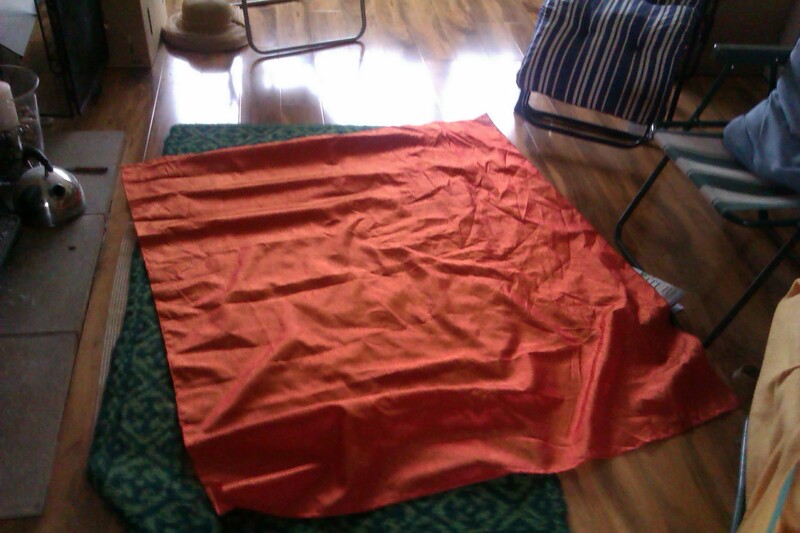 We started by rolling the ‘core’ in some tough cotton fabric that my sister had in her sewing box. I should say at this point that the fabric has been waiting to be used for more than 25 years… I know this because it was bought at the same time and from the same place as the stuff I used to make my latest shopping bag. We bought it when we were both still living with our mum and dad in Leeds! The ends were tucked in carefully and I hand-stitched this covering in place. 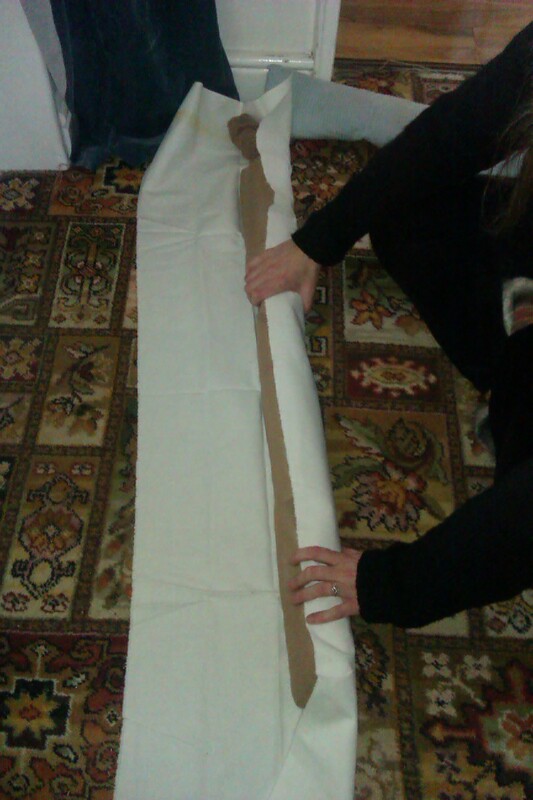 Now, a cream-coloured draught-excluder is not ideal and, anyway, we wanted it to match the rest of the hallway. Up the stairs, above the front door, is a window. 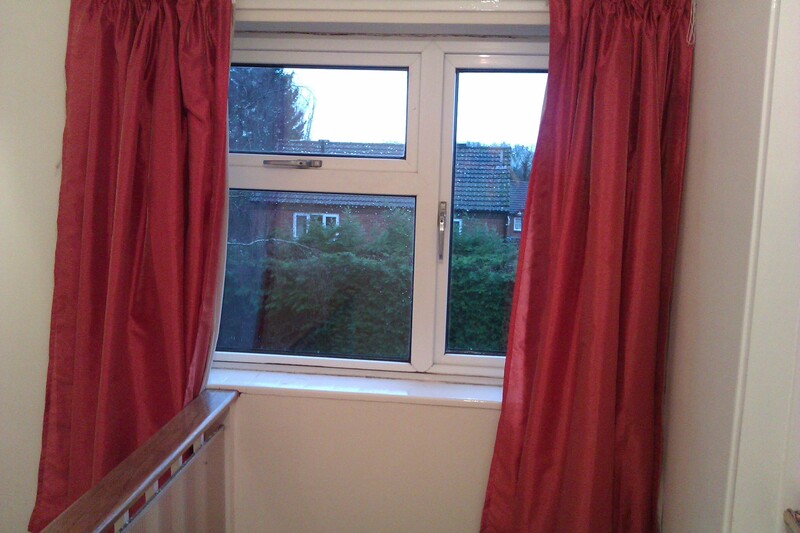 My sister had some orange curtains that she wanted to use there, but these were far too long and some pruning and hemming was required. So, I chopped off the bottom of these curtains (she doesn’t much like putting scissors to fabric, but I’m quite blasé about it) and we had plenty in the off-cut for our covering. Some more rolling and, pinning and stitching (making use of the bottom finished edge to avoid having to turn a hem) and we had a completed and completely free draught-excluder for the front door. It was round about this time that I had to return home, but the creativity did not end there. 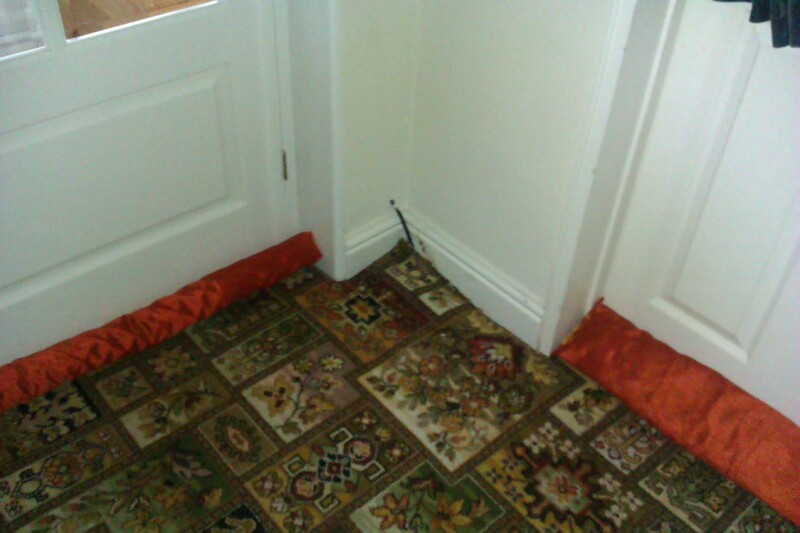 The next day, via e-mail, I received pictures of the original (narrow) draught-excluder also covered with the orange fabric, in place along the bottom of the door from the hall into the living room, plus a picture of the shortened curtains newly hung in the window. I love making something from nothing like this… and so useful too.